3 Bedrooms, 2 Baths,with family room (Sleeps 8), 1400sq. ft. Your best memories, come included in the price. More than a vacation, a place where family gets closer, and friends get friendlier. Just built and brand spanking new for 2009. Welcome to your 3 bedroom 2 bathroom duplex. 20 mins. to Midtown. 1400 square ft, close to restaurants, supermarkets. Comes with laundry room and back yard. You get access to laundry room. For Larger parties, you can rent the 1st floor 3bedroom 2 bath and the additional Lower level, (2200 sq. ft., at add'l cost), the lower level is $70 extra a nt. It have additional beds, den area, 1 additional bathroom with shower and access to laundry. 2 short blocks to LIRR, and other forms of transportation. Never fear one of the safest neighborhoods in NYC. It is only for a limited time so take advantage and call me. Great nightlife, shopping, golf, parks and sight seeing. 10 mins to Laguardia airport, 20 mins. to JFK. Great price for great space. Quiet and safe neighborhood. Keywords: Great for families reunions. Easy access to the city. Great neighborbood, excellent restaurants, Newly constructed, Large rooms. Additonal sitting for 2 by kitchen , also 2 stools by kitchen island, Add'l dining area in family room for 4. This was our first visit to New York, and the house was a great base for us to explore from. 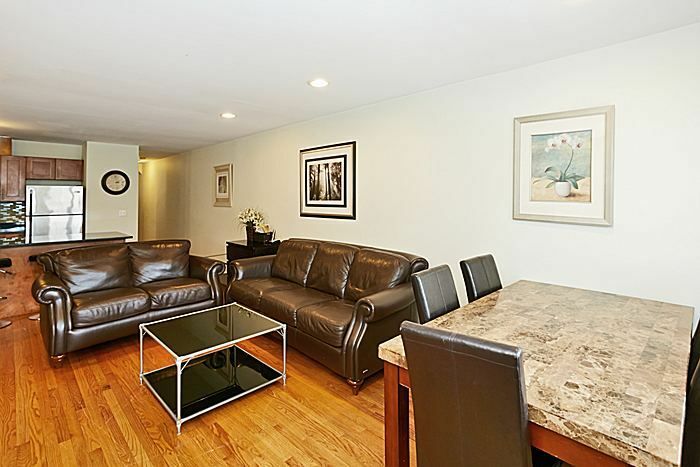 The house is in a quiet neighbourhood, and literally only a 3-4 minute walk to the Bayside LIRR station which takes you into the centre of Manhattan (Penn Station) in about 30 mins. That was super convenient for us as a family group of 2 adults & 3 kids. There are also grocery stores and various restaurants all within easy walking distance. The driveway is a bonus, although it is quite narrow and shared with the other unit - getting our minivan onto it was a pretty tight squeeze, although it was also possible to park on the street nearby. There is a house being constructed next door at the moment, although the builders were pretty quiet and didn’t really disturb us. This home was extremely nice as far as layout, space and bathrooms. Well maintained. The only thing I would have to say that is negative is that there was nothing in the home when we arrived. We had to purchase everything from salt and pepper to paper towels. And I would recommend that the owner tell people that the basement is not included in the rental of the other rooms. I assumed it was and it wasn't. The basement is extra. So if you planned on using the washer and dryer you cannot unless you purchase the basement. ALSO IT IS EXTREMELY HARD TO FIND PARKING AT THIS LOCATION ALSO. We assumed we had the driveway included in the rental since it was pictured, but she let the family that was staying in her rental next door use the driveway the whole time they were there because they had young kids. I understand that but I do not understand why both rentals couldn't use the driveway as it had plenty of space and then it could be worked out as far as letting each other out when needed. We had to hunt for parking spaces every time we would return. Not ideal especially when you have to purchase so many things for the home and lugging all those bags down the street or blocks away. We enjoyed our stay for the most part because the house was ideal for what we needed. And as I stated before it is a nice home exactly as pictured. We really enjoyed the stay. Great location and beautiful condo. Very clean and close to a lot of local restaurants. Very clean, plenty of space, all working appliances, comfortable furniture and beds, amazing showers. Nancy is a wonderful person. Responded to my text immediately. I would recommend this place to anyone in my family. I would stay here again. Bayside is a nice place to come back to when leaving NYC. Plenty of places to eat in Bayside. LIRR is two blocks from rental. MTA bus is one block away. 2 washing machines and dryers that worked just fine. Dishwasher cleans really well. don't hesitate to ask me any questions about the place, all 8 of us liked it. We split our time between the two units. This one is the larger of the two. The location is wonderful and Nancy was very responsive to any questions I had. We would stay here again. We ended up staying in the rental unit on the second floor above this unit due to a scheduling conflict. It was pretty much the same thing other than a flight of stairs to climb. We are a family of 6 with our children being older teenagers to young adults. There was plenty of room for all of us. Everything was very clean and looked very nice. We all enjoyed sitting around on the sofas at the end of our day and talking about what all we saw that day. The neighborhood was very nice and we were two blocks away from the LIRR which we used every day. There were plenty of restaurants, groceries stores, bars, and nice nightlife to be had within very short walking distance. This was a great place to unwind after spending a day in the city. It typically took us 25 to 30 minutes to get from our apartment to Times Square. It took us about a half an hour to get from LaGuardia Airport to this rental. We prearranged to ride with a limo service since we were a group of six. It cost us about $75 and we all fit nicely in a Chevy Suburban. We will definitely come back here again if we ever visit New York in the future.